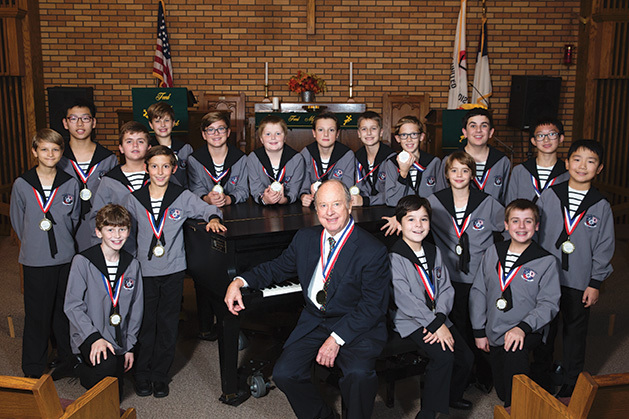 North Star Boys' Choir Forges "Voices of Gold"
The North Star Boys’ Choir makes music and magic. Like trained athletes, these choir members spend hours practicing and honing their craft. Stockwell has been interested in music since he was just a kid, joining his church choir at the age of 7 and learning piano and violin at the age of 13. “I heard the Vienna Boys’ Choir when they visited New Zealand, and that was very good,” Stockwell says. “From that point on, I swore that I would find out how they sang so beautifully.” Stockwell moved to Vienna at the age of 30 and worked with the Vienna Boys’ Choir for about year before he moved to Switzerland to work at an international boarding school. When he left Switzerland in 1997, he moved to Elk River. “The singing techniques, I brought with me in 1997 to Elk River,” Stockwell says. Stockwell began the North Star Boys’ Choir in November 2011 after it branched off from the Land of Lakes Choirboys. The choir has 40 boys spanning across four separate choirs. The choirs are separated by age, with ages 5-7 in the Music Magic Choir, ages 8-12 in the Cadet Choir, ages 8-14 in the Vikings Choir and ages 15-23 in the Kantorei Choir. The Music Magic and Cadet choirs go from September to May, while the Vikings Choir goes from September to the end of June. A summer camp is held the third week of August that involves singing, crafts, archery, swimming and more. In order for the boys to get into the Vikings Choir, they have to have gone through the other choirs. “When they reach a certain stage and show an aptitude and hard work and demonstrate that they are indeed musical and then they are accepted into the Viking Choir,” Stockwell says. The Viking Choir tours nationally and internationally. In 2016, members visited Switzerland, Austria and Germany. Next year, they will travel to Norway and Germany. Each choir rehearses once or twice during the week, and the Viking Choir even practices for an additional five hours on Saturdays. “Quite long hours, but they learn a lot of music,” Stockwell says. Weekly rehearsals are held at Immanuel United Methodist Church, Corcoran. They focus on learning classical music from composers like Bach and Mozart. “We also sing Barbershop [music], which is very unusual for a boys’ choir. That’s usually for adult choirs,” Stockwell says. The long hours don’t seem to faze the boys, according to 10-year-old choirboy Sebastian Cerda. “I never thought I could sing and perform, but when we do, it is like magic, and we have seen many people smile, cry with joy, and be happy when we sing,” Sebastian says.